A use case for Crystal, including porting a Ruby script to a Crystal binary and publishing it via Homebrew. An in-depth explainer of all the statistics returned by GC.stat, such as garbage collection & heap slot counts. Clearing up how Ruby Central, RubyGems, and Ruby Together are funded, including sources and allocation. 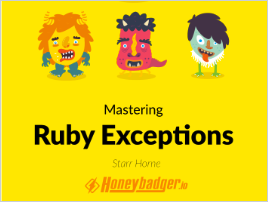 How well do you know Ruby's exception system? This free thirty-nine-page book will take you from novice to expert. A three-post series that delves into linearization, blocks and procs, and scopes. Another entry in Airbrake’s "Ruby Exception Handling" series, this one on EOFError. Here’s another on FiberError. Not a particularly techie story but lots of great insights that could benefit you if you want to tread a similar path. The third installment of the series dives into how to find methods, even if they don’t exist. Coming soon and seeking early adopters. How do you stop ops from stealing your dev time? Sign up to OpsCare for fixed-price, monthly Rails support for less than $1 per hour and ensure your app is online and doing what you expect. The differences between dup and clone along with what can be safely duped and cloned. This solution uses Nginx to forward the appropriate headers. Various approaches to testing out the pieces of your app that use external services. It displays the execution plan Postgres’s planner generates for an SQL query. How two engineers at Airbnb executed a shell command via JSON. A complete solution for securing a Rails app on Heroku using their free SNI-based SSL and LetsEncrypt. A policy for enforcing immutable middleware in your Rack stack. For smarter importing of CSV Files as Array(s) of Hashes.